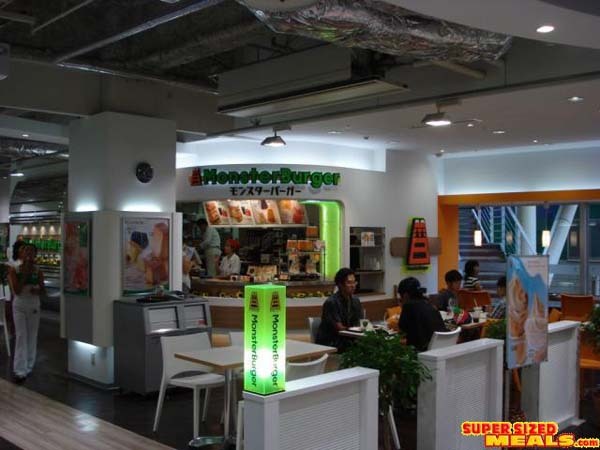 OK, OK, photos of weird Japanese fast food arenâ€™t that exciting. Iâ€™ll try not to do this too often. But it snowed yesterday. Itâ€™s bloody cold. I cannot be faulted for looking through vacation photos from August in an effort to remember what summer feels like. On this particular day, I was at the Decks shopping mall on Odaiba, looking for souvenirs for the folks back home. Iâ€™d just survived the third day of Comiket, Iâ€™d been walking a lot, and I was kind of worn down - if I was going to get any souvenir shopping accomplished, I needed food. 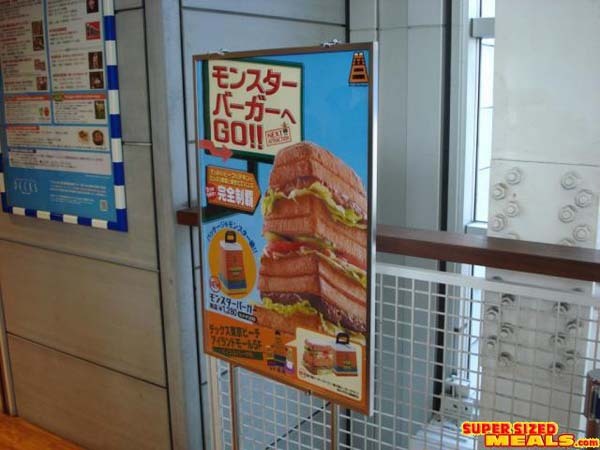 It says â€œGo to Monster Burger!â€�, by the way. This was actually a pain in the arse to find. It turns out that theyâ€™ve turned one floor of Decks intoâ€¦ intoâ€¦ well, kind of a â€œfitness themedâ€� amusement center called Muscle Park, with all kinds of activities that try to be healthy and good for youâ€¦And then they stick a massively unhealthy fast food place into the middle of it. After youâ€™ve enjoyed the exercise-themed fun of Muscle Park, why not relax with a Monster Burger? And maybe some soft serve ice cream? And cake? 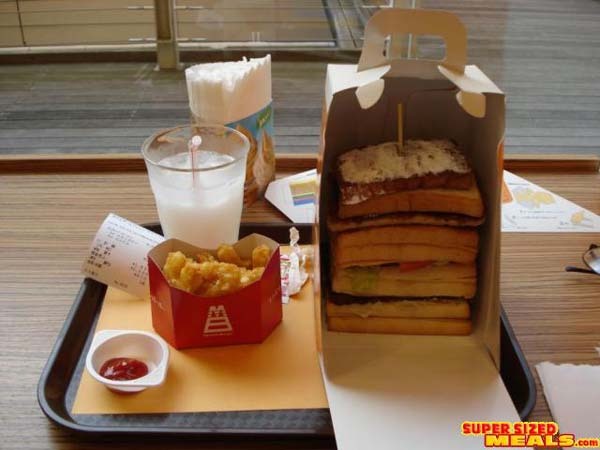 I ordered myself a Monster Burger â€œSetâ€� meal, with â€œPotatoâ€� and â€œCalpis Sodaâ€�, and took a window seat. A few minutes later, a happy Japanese fast-food employee came up to me and deposited this in front of me. Now, Y1630 is about 15 bucks. Thatâ€™s pretty expensive for fast food, and actually more expensive than some family dining places. But at a family diner, you donâ€™t get your food in a MONSTER BOX, now do you? 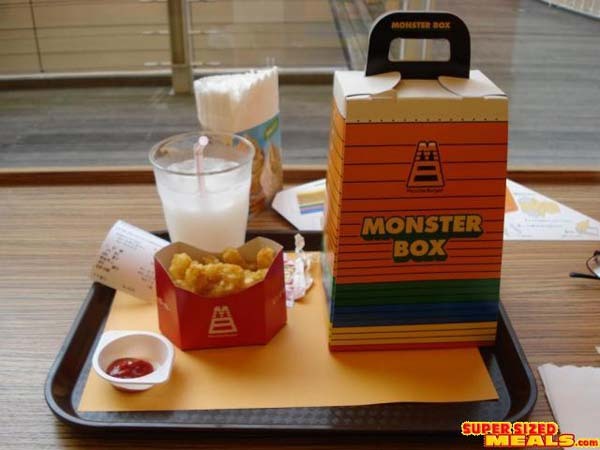 As an aside, the Monster Box - and the cakes they sell - are shaped like a piece of Japanese gym equipment. Just to keep the fitness theme going, see? I actually had a couple of doubts about this at this point. The thing was far too tall to pick up and eatâ€¦ and for some reason it had powdered sugar on top. 1) Dessert. That being the bit with powdered sugar on it. 2) A chicken sandwich. That being the next layer down. 3) A salad sandwich. Yes, lettuce and so on in a hamburger bun. 5) Another layer which was just another bottom hamburger bun. The whole thing was actually kind of nasty to eat. I managed to finish off the three â€œfoodâ€� burgers, but the dessert - and the inexplicable extra bun - were just beyond me. Youâ€™ve got to eat that damn burger and pretend to smile. Because thatâ€™s what a guyâ€™s got to do. Awesome box!!! But there is so much bread! Needs more meats... and some dried squid. The foodie sounds like such a fruit. Why did you have to smile? I don't think that a burger with that much originality is available everywhere and you seemed to enjoy 3 of the 4 sandwiches, why are you acting like you were disgusted? You're a corny Brit. cool post btw billy, your stories are what keep most of us coming back.